PLANNING ELEMENT 1: Goal Setting – Establish sustainability goals that reflect utility and community priorities. PLANNING ELEMENT 2: Objectives and Strategies – Establish objectives and strategies for each sustainability goal. PLANNING ELEMENT 3: Alternatives Analysis – Analyze a range of alternatives based on consistent criteria. PLANNING ELEMENT 4: Financial Strategy – Ensure that investments are sufficiently funded, operated, maintained, and replaced over time. Having the capacity to compare a range of infrastructure alternatives objectively is critical to a water or wastewater utility’s long-term sustainability and its ability to serve the needs of its community. 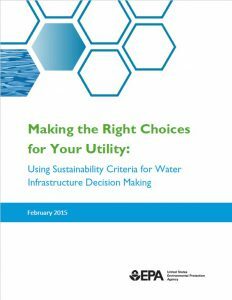 This guide is designed to help water and wastewater utilities undertake these critical comparisons, in the context of meeting their existing regulatory requirements and improving the sustainability of utility operations.